If you are involved in any kind of email marketing or managing your business or work emails, you must be familar with a term known as "Bounced emails". Bounced emails can quickly pile up if you start ignoring them and can affect the deliverability of your emails. Worst case scenario, they can even cause blacklisting of your entire email list. All the hard work you did to build the email campaign from the ground up to market your brand and business can be wasted if you have been ignoring bounce emails and not doing anything about it. There are many store owners who are taking advantage of multi-store feature in nopCommerce. This feature has become quite matured since it was originally added to nopCommerce. With every new version of nopCommerce, a new feature for multi-store is usually added depending on the most requested features. 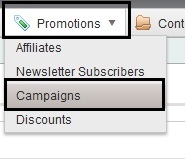 A very useful feature has been added in the latest nopCommerce 3.50 version that allows store owners to send campaigns / emails to subscribers of a particular store while using multi-store feature in nopCommerce.